When I was asked to write an op-ed about my Olympic experience in Beijing, I was really concerned about what to focus on. What do people really want to read about? Politics? The Games themselves? The country? I don’t feel I’m qualified to offer anything in depth about any of the above since my experience was limited to the Canoe-Kayak competition, a hotel outside the village, many buses, and one trip to the Great Wall. Nevertheless, I had the experience of a lifetime. So I decided to write about my personal view of the Games and the impression they made upon me. In a word, the Games were immense. Even though I lived it, I still can’t begin to imagine the amount of organization that was required, the literal army of volunteers that had to be coordinated and the buildings that had to be constructed. In the end, it all added up to some of the greatest drama you’ll ever see. The Olympics are reality TV at its best. Emotions are real, personalities are bared, and the rules are relatively simple; athletes either bring their “A” game or they don’t. I think amateur sports are one of the purest examples of human will power, and I am proud to be a participant. My experience was the culmination of years of training and a summer of hard racing where I needed to perform well at four separate events in order to qualify for the Games. I was an outside shot at even making the team. My fellow competitors for the spot are all amazing paddlers and I’ve lost to them each year for three years. I didn’t really realize I was an “Olympian” until I was actually at the Games themselves, and then I finished third in my one and only race – a bronze medal. I still have trouble believing that. The Games, for me, were organized chaos at its best. Everything went smoothly and efficiently but there was an underlying angst among all of the volunteers and military personnel. Even the taxi drivers were anxious and seemed to always be lost. However if you can look at the Games as they were originally intended to be, that is . an apolitical sporting event with the best amateur athletes in the world, they were perfect. Since these were my first Games I have no basis of comparison, but in speaking with “multi-game” athletes and the media these Beijing Olympics were at the top of everyone’s list. Of course it has always has been impossible to remove politics completely from the Olympics. From the bidding process, to being named the host country, to the closing ceremonies everything is a show with political undercurrents. These Games were used, successfully in my view, by the Chinese as a showcase of their awesome culture and history, not to mention their “willingness” to sacrifice their own comfort for a chance to play host to the world. The “show” that they put on was incredible, from the corps of volunteers, which numbered in the hundreds of thousands, to the amazing venues and the organizing committees. Everything I experienced personally was great. My only complaint lies in that it was so organized and so safe that it became redundant. It can get frustrating showing your ID to the same guard twice a day everyday for three weeks. I’ve been asked many times over the past two weeks about how I thought the Games unfolded and each time I’ve answered that I felt they were great. From an athlete’s point of view, I really have no complaints. Most people are by now aware of the myriad of humanitarian concerns whose profiles have been raised by the international scrutiny of the Games. Like most Canadians, I have my own opinions about these issues and it was important for me to put them aside and be an athlete competing for Canada. Whenever I pull on my unflattering spandex with “Canada” written across it and prepare for a race, I want to make myself, my friends and family, and my country proud. In my case the Beijing Olympic Games offered the opportunity to do just that. 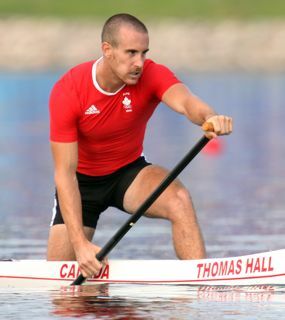 Tom Hall is a McGill phys-ed and kinesiology student. He won the bronze medal in the C-1-1000m (single canoe, 1,000 metres) at the recent Beijing Olympic Games.